It’s summer and you live in the land of pleasant living. I hope you’re enjoying it. If your idea of fun is sitting in the hot sun, live-lining, soaking bait, or trolling, this entry isn’t for you. But if you like blasting through the spray on a fast boat, swerving around hairpin turns, and stopping on a dime to cast top-water plugs & jigs toward screaming birds over frenzied fish, you’re in the right place to enjoy some of the most exciting action the Bay has to offer. On an average summer day, a knowledgeable light tackle angler will catch more fish by accident than most bait fishermen can catch on purpose in a year. 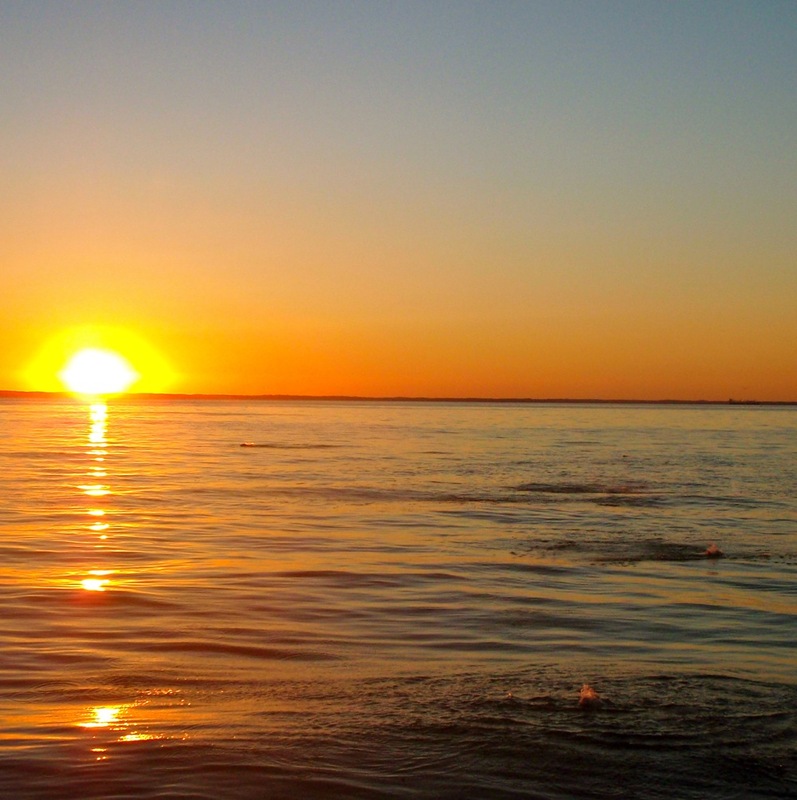 It’s time for running and gunning beneath working birds on the Chesapeake Bay. Summer breakers are here, and it’s your mission to find them. In an earlier segment, I wrote about how important it is to stay as close as possible to hard bottoms when looking for open-water summer fish. In this entry, I’ll say a little about looking for breakers including some strategies for fishing beneath working birds. I’ll also mention some individual species and cover what they might tell us about the fish. 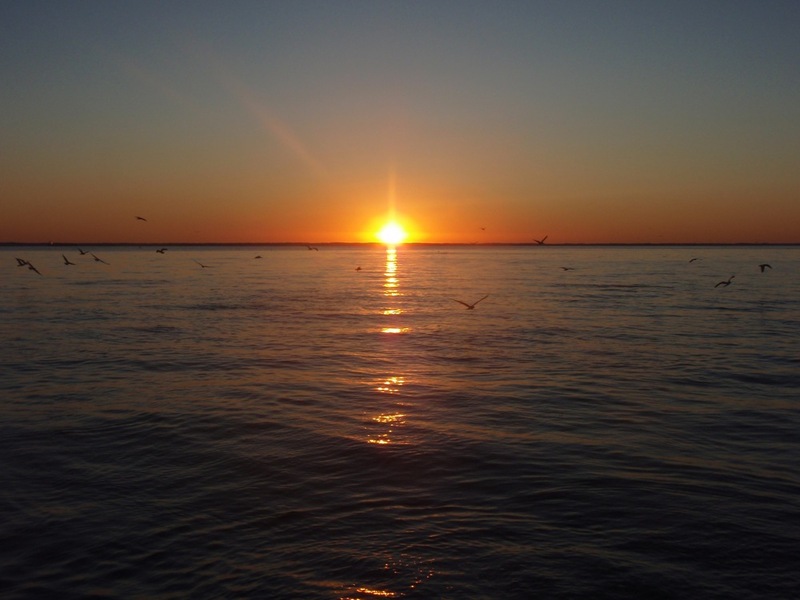 First the basics: working birds means gulls, terns, and other species that are actively feeding on bait that is forced to the surface by blitzing stripers. It’s important to recognize the difference between birds that are working and those that are simply skimming bait, or flying from one place to another. Working birds usually swirl in tight circles and hover very close to the water. 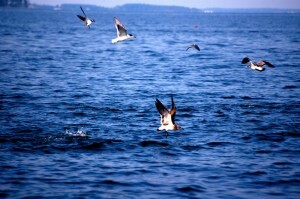 They frequently swoop down to pick off bait from the surface. They can work in flocks of two or three, or in hundreds. In addition to gulls and terns there are also a few pelicans around. Sometimes the different species all work together, but not always. Each type of bird tells us something a little different. A good set of binoculars is very helpful for finding birds on the Bay. Most light tackle anglers won’t leave home without them. You usually get what you pay for with binoculars, so it’s worth it to spend a little more for a set with good lenses. Since we’re usually scanning the horizon from a rocking boat, stabilizer binoculars are especially beneficial. I don’t have stabilizers, but I keep a set of waterproof 7X50s with good optics on the leaning post when I’m running and gunning. In the spring, black-faced laughing gulls are the most common bird fishermen are likely to encounter. Named for its well known laughing call, laughing gulls winter over in the islands of Assateague and farther south, but they return to the Bay early in the year. They aren’t usually found in huge flocks, but they often get together over fish. In early spring when there aren’t so many other gulls around, laughing gulls can be a big help in finding breaking stripers. They’re still around in July and August, but they’re now competing with their larger cousins, herring gulls. 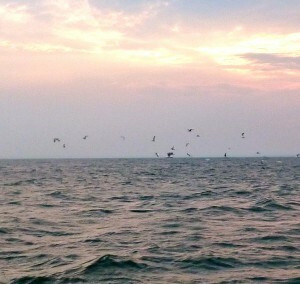 Herring gulls are the most common gulls on the Chesapeake. Their bodies can be white, gray, or almost black. Herring gulls have an uncanny means of communicating. They somehow know when fish are blitzing miles away and they often fly directly to the commotion. Big flocks of herring gulls over open water means there are fish below. If you see a lot of gulls flying off in the same direction, it pays to follow them. Chesapeake herring gulls mate in the spring and early summer, so there are fewer over the water during this time. By late fall, they are here in force with some fish-chasing flocks numbering in the thousands. Herring gulls can live for 30 years or more and grow to be very large. Some have wingspans approaching five feet. It takes four full years for herring gulls to reach their adul t plumage. Younger, smaller herring gulls are speckled with lots of brown and gray on their wings. As they get older, their colors fade. Just like young rockfish, immature herring gulls feed on rain minnows and bay anchovies. 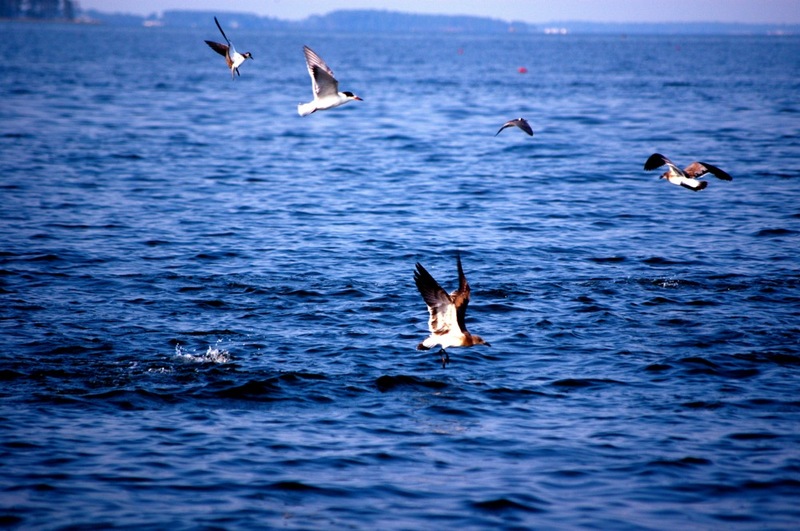 In the fall, many fishermen are fooled by large flocks of immature gulls. Small dark-winged gulls over shallow water almost always mean small fish below. The birds are learning to catch minnows just like the little stripers beneath them are learning to round them up. It’s unusual to get keeper rockfish under immature gulls. On the other hand, adult herring gulls prefer bigger bites so they’re more likely to be chasing baitfish over four inches long. Since that’s the same size bait big stripers prefer, light tackle fishermen who are looking for trophy fish know to bypass the small birds and look for flocks of bigger ones. Big birds equal big fish. Terns prefer smaller bait, so they won’t usually put you on big fish, but they will lead you to areas that can be productive. Unlike gulls, terns can catch bait on their own and don’t need the assistance of schooling fish. Five species of terns call the Chesapeake Bay home: the Caspian tern, the royal tern, the common tern, the least tern, and Forster’s tern. The Caspian tern is the biggest and the least tern is (appropriately) the smallest. While I can usually identify a Caspian tern or a least tern when I see them, I can’t always tell the other terns apart. For practical fishing purposes, I’m not sure it matters. Terns are easily confused with gulls, but there are significant differences. Terns are smaller and faster and have forked tails. Their wings and bills are sharply pointed. When they fly, they seem to always be looking downward and they plunge headfirst into the water to retrieve their prey. In the spring and early summer when there aren’t many gulls around, it can be worthwhile to look for terns, especially if many are flying over the same area. A few terns here and there indicate the presence of small bait, but they probably don’t indicate feeding rockfish. Brown pelicans are rare north of the Bay Bridge, but it won’t be long before they’ll start showing up around the False Channel and even at the mouth of Eastern Bay. 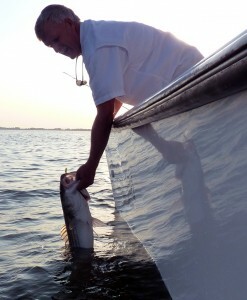 They prefer shallow water, but they will work bait over the deep Bay when it is plentiful. Every year we seem to get more pelicans in the region. They have good eyesight, so they can search for bait from high over the water. When they spot it, they ungracefully come crashing down headfirst. Pelicans prefer larger bait but they will also crash on rain minnows. I’ve seen them work blitzing fish right along with gulls and gannets, even in cold weather. It can be worthwhile to watch them because they can put you on fish. There have been times in the mid-Bay when the only way I could catch fish was to motor over quickly where I saw a pelican dive and start casting. If you see three or four pelicans diving in the same place, it’s definitely worth a look. I’ve only mentioned a few species of the many that are on the Bay. I’ll have a lot more information about birds available the future. For now I hope this will be enough to get you in the hunt. Locating birds over blitzing fish is one thing, knowing what to do when you find them is something else entirely. Every summer I see rookie fishermen storm up right in the middle of blitzing fish with engines roaring, radios blaring, and shouting like schoolkids. The obvious result is that the fish go away. When you find breaking fish, look closely at the direction the birds are flying. They are almost always facing the wind and turned in the direction the fish are moving. Make a wide circle around the birds, settle in above them, and kill your engine. You’ll either drift over the fish or they’ll swim right toward you. If you leave your engine running, they won’t get close. If you are stealthy enough you can often see stripers cornering bait right up against the side of your boat. Once you drift past the fish, or when they move on is the time to restart and make another wide circle. By repeating this process you can sometimes stay on the fish for hours. It is incredibly bad manners to run into the middle of a group of boats that are already set up and fishing under birds. It’s also rude to troll through breaking fish when there are other anglers casting. It’s silly to troll around breaking fish anyway, but that’s all some anglers know how to do. 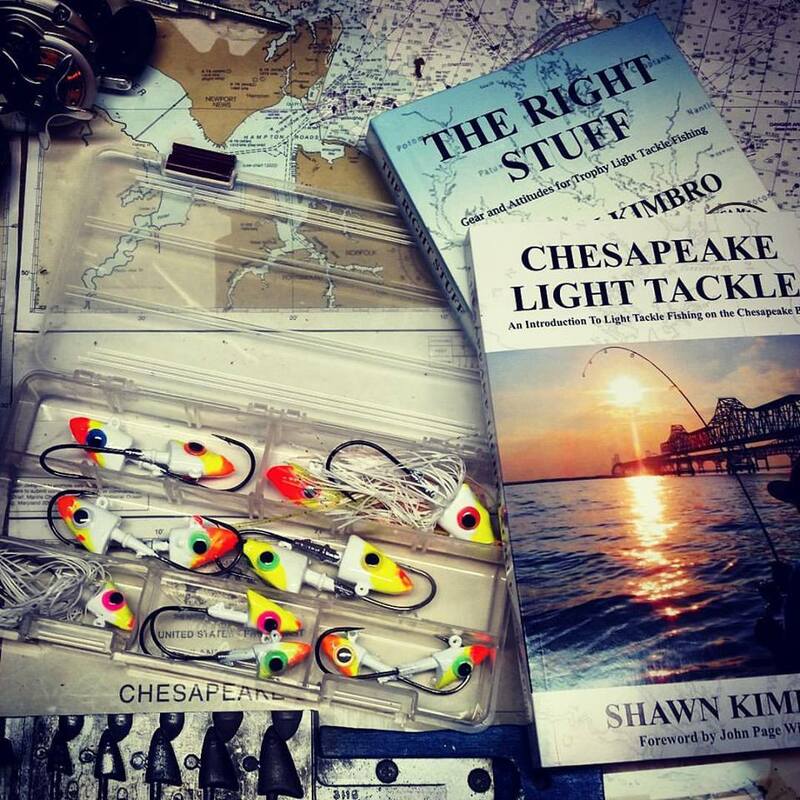 It’s summer in the Chesapeake, so crazy things are going to happen, especially if you’re fishing in the better-known locations. Your best bet is to stay cool and move away from the crowds to look for fish at other places where there aren’t so many idiots. By running the oyster bars and maintaining a sharp lookout you can often find fish away from the crowds. I fished two evenings th is week. My first trip was a pre-sunset buzz out to the Bay Bridge. 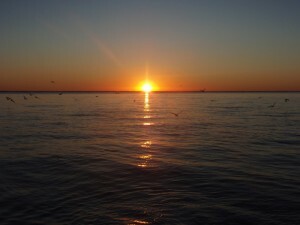 I arrived about 7:30 PM to find good incoming current and a lot of small fish feeding. I pulled a couple of keepers off the pilings, but there were too many boats around to suit me, so I moved on. I checked some hard bottoms in the Upper Bay, finding a few birds working small fish well to the north. I finished by throwing a top-water plug over submerged structure until dark. Rich joined me Thursday evening on Thunder Road. We launched at Shipping Creek and made the exact trip I used as an example in Part I of this series. It took a while, but we eventually found nice fish under working herring gulls and terns. We caught several on half-ounce jigs with chartreuse BKDs, but the bigger fish blew up our top-water plugs. Another good tip to get the best fish out of a school of breakers is to throw big surface plugs. Little lures tie you up with small fish. Full size Stillwater Smackits, Lonely Angler Holos, or saltwater Super Spooks are my favorite surface plug to throw into breakers. The little ones will swirl at them and miss, but you’ll know when a big one attacks. Temperatures are very hot this week, so it’s best to fish early mornings and late evenings if you intend to release fish. They don’t do well when exposed to air temperatures over 90-degrees. 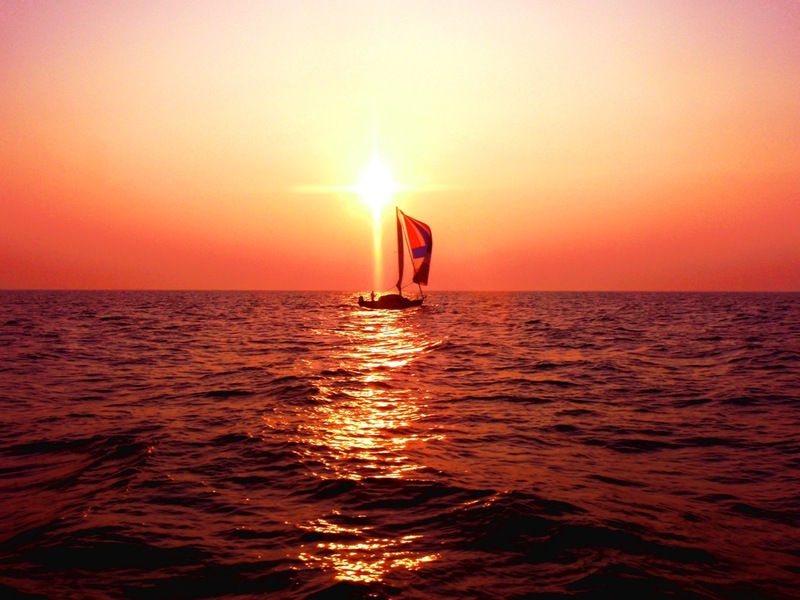 I’ll sign off with a sunset shot I took Thursday of a lone sailor making his way across the Bay toward Annapolis. Good luck finding those birds and breakers and stay cool. Great read. Saw 3 Pelicans cruising and diving off of Tilghman Point this week. “On an average summer day, a knowledgeable light tackle angler will catch more fish by accident than most bait fishermen can catch on purpose in a year”…….. Brother that about says it all…LTJing was referred to as boring in a report this past week…what a ridiculous statement.. Being in direct contact with your bait…doesn’t get any better.. Tons of great info in this report..
Get article, I always love to read about your fishing trips. Thanks for taking time to help us be better fisherman.. This is a great read. I’ve been fishing the bay for 5 years and never really understood the difference between the different bird other than big birds meant big fish. I’ve followed that rule and it’s proven worthwhile. I did see 6 pelicans near Bloody this past week. They put me on the best fish so far this summer. I did very well jigging and topwater last yesterday. WE followed the map over hard bottoms like you said and found the fish before the birds found them. I owe you bigtime. Great insight! I’ve known to cut the engine away from the action, and I’ve had my share of breakers coming to me, but this is an eye opener. On an unrelated note, I finally made it to sandy over the weekend and calibrated my meter. Blood red = hard bottoms. Whoo hoo! Game on. Thanks on all counts Shawn, and keep up the good work. Great info and an enjoyable read… Your informative articles have shortened my learning curve greatly! I wish you chased flounder as much as stripers! Hi Shawn, can you give me any advice for finding bigger fish? My boys and I have found some breakers following your advice but they are all little. I know you and Jamie and all get keepers and catch some bigger fish. Any help you guys can give me would be very nice. 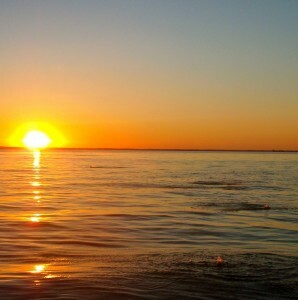 By the way, your last photo is stunning. Chesapeake Light Tackle is my favorite website. After finding multiple schools of breakers yesterday and reading this tonight, you are spot on. And Amen to LTJ over LL and trolling. (although I’m guilty of doing both from time to time). Thanks for the tips.